This month had been an active one for me as I got some time to write and post them here. Wishing everyone a rocking week ahead! 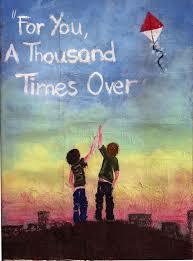 For you a thousand times over! That voice is not our heart or our soul, it’s that friend who is with us through our thick and thin. Often we end up into situations where we don’t feel confident in our own potential. But there is a voice that keeps reminding us of our worth and don’t fail to encourage no matter what. That voice is not our heart or our soul, it’s that friend who is with us through our thick and thin. Hassan the quiet and the most important character from “The Kite Runner” is a reminder of that friend who genuinely mean when they say or feel – “For you a thousand times over”.